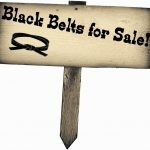 HOMEDiscipline Kids & ChildrenBlack Belts for Sale! Cheap! Karate students are always so excited to earn their next belt rank, and understandably so. The next rank up shows that you’ve learned some things; it’s something to be proud of and shows your hard work. Plus, you no longer have to stand at the end of the line! Inevitably though, some students get impatient. Often, parents also get impatient. It’s always hard for me to tell a child that that they cannot test in an upcoming exam. Equally frustrating is explaining to a parent why a child isn’t ready to test. We are well aware that in other schools, young children can earn black belts in a year. We’ve had many of these kids transfer to our school – unable to fight and lacking basic self-defense skills. Different styles have different requirements. Some schools are happy to continue to promote to new rank as long as someone keeps paying the tuition or as long as a contract has been signed. I cannot in good conscious go along with that and would rather lose a student than advance someone to a rank they have not earned or are not ready for. 3. Demonstrate knowledge in basic curriculum. 4. Demonstrate Shifts 1 & 3 to the left and right. That doesn’t sound bad… let’s break it down. 24 classes = 24 weeks (6 months) if attending once per week. Or, 24 classes = 12 weeks (3 months) if attending 2 classes per week. These timelines are not inclusive of holidays, weather related closures or illnesses. Most students attend twice per week. Meaning it will take about 3 months for you to be considered for the yellow belt exam. Everyone learns at different paces though. 1. One Stripe – Student is starting to get the hang of class etiquette and basic curriculum. Student has started learning Shift # 1. 2. Two Stripes – Student begins to demonstrate further proficiency in the basic curriculum and has started learning Shift # 3. Student can execute a basic sparring combination. 3. Three Stripes – Student can now do basic curriculum without looking at other students. Student has learned Shifts 1 & 3 to the left and the right and can do a basic sparring combination. Young students are required to know their address and phone number at this level and before testing for yellow belt. Students with 3 stripes are considered eligible or close to eligible to test for yellow belt. The Basic Curriculum is not really that basic! The shifts are an exercise that puts together several of the basic techniques into one form. They are relatively short but lay the foundation for learning kata later on. Shift One: Includes movement within a forward stance, down block, inside block, front kick, reverse punch and kias! This requires a lot of coordination for students and is often difficult to master at first. However as with any new endeavor practice is very important and we have never had a student who couldn’t learn it with practice. Shift Three: Includes movement between straddle leg stances and forward stance. This is also challenging to new students but is a foundational necessity. 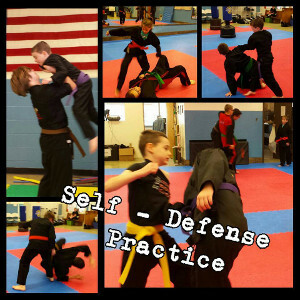 Also included in this are knife hand blocks, down block, round house kick, back fist, reverse punch and kias. Last but not least are a positive attitude and 50 jumping jacks! If your child is not moving a long in rank as fast as the neighbor’s kid who is at a different facility, please understand that there is a reason for that. Our students are all held to the same requirements; adults & children must meet the same standards. Children are not given rank simply because their parents are paying customers. We sincerely care that our students EARN every thread of fiber in their new rank. When your child puts in 3 to 6 months of hard work to earn their yellow belt, they will be very proud of themselves! As you can see from the requirements above, they have every right to be! 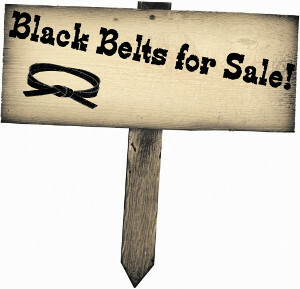 No Comments to "Black Belts for Sale! Cheap!"